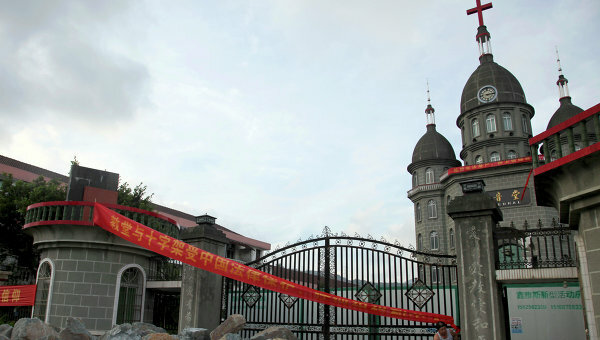 MOSCOW, September 16 (RIA Novosti) - Christians in eastern China have come out to protect the symbol of their faith on the top of the Christian church in Pingyang County in Wenzhou in a standoff with the local authorities planning to forcibly remove the cross, CNN reported Tuesday. Wenzhou is a coastal Chinese city nicknamed the “Jerusalem of the East” for its large Christian population. Throughout the past year local Communist Party authorities have demolished scores of churches and have forcibly removed more than 300 church crosses. Local officials claim that the demolished churches were illegal structures exceeding the permitted structure size four times. Denying the crackdown on Christianity, they assert the demolitions are part of a broader campaign targeting illegal structures in the province. Church leaders view the government’s campaign as a fight against “Western culture,” of which Christianity is considered to be a part of.